With the start of summer vacations, your naughty one needs to be engaged in playful yet healthy activities. Flipkart.com brings for wonder kids, a varied range of board games to let your fidgeting kids play indoors in those hot summer noons. These are very interesting games and at the same time groom your kids’ brains. Games like scrabble, chess, weaving looms, dictionary practice, mathematics as fun, angry birds space board game, carrom and a lot more. And why only kids, even you can enjoy and have fun with your kids to have a nice family time together. Check out details and order now. 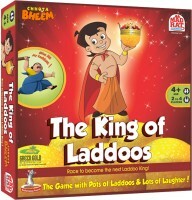 How to get this Board Games at discounted price of Rs 89?